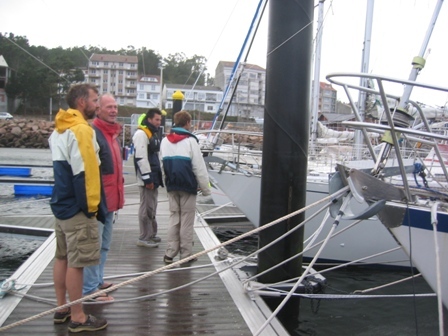 On September 5, 2006 0815 LT we left Camaret with calm seas, patchy fog, and no wind. The weather charts and forecasts suggested an improving weather pattern. Although the fog lifted during the day, it returned in the evening, with less than 5 knots wind. We spend the first day motoring at about five knots. Our Swedish friends aboard "Shangri La" who were accompanying us in the Biscay crossing discovered that their radar did not work beyond 1 mile. We then decided to sail closer together, and have Dalliance play traffic control for both our vessels. 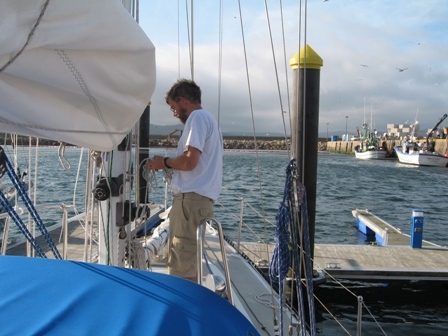 The next day the wind returned with 10 knots out of the NE, we could finally sail and turn the trusty diesel off. It was great to be able to listen to the sound of the wind and waves instead of the steady droning of the engine. The wind gradually picked up and made for some great sailing under clear moon-lit skies. Calculations underway, however, revealed that we needed to either sail at 4 or 8 knots to arrive in daylight in La Coruna. 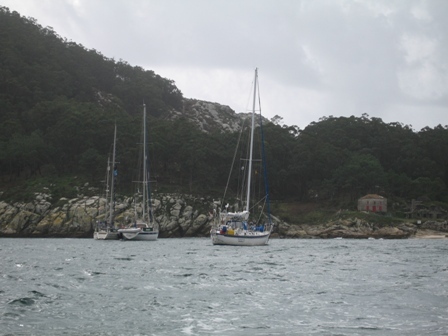 We tried to slow the boat down with a reef in the mainsail, but it appeared that Dalliance smelled the stable, and galloped at a steady 6-7 knots to La Coruna. 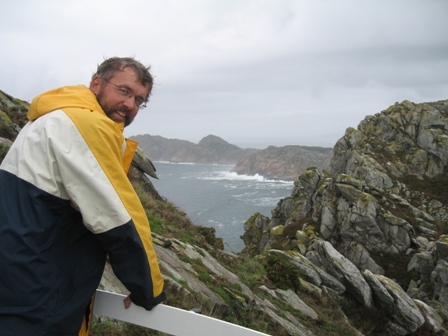 On September 8, 2006 as the skies remained clear, with a near full moon bathing the seas in a silvery light, we decided to make a landfall at night time in La Coruna, instead of heaving to amidst traffic along the coast of Spain. 0330 hrs LT (0130 UTC) Our arrival in La Coruna was made easy by the excellent navigational lighting, including the Torre de Hercules, (The oldest functioning lighthouse started by the Romans.) as well, of course, by GPS chart plotter and radar. 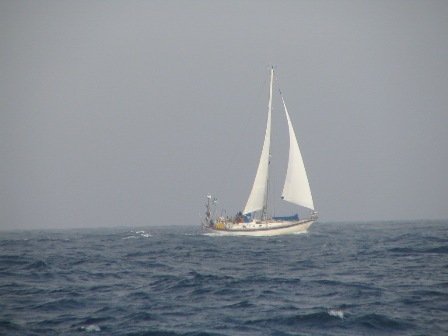 Here is Dalliance on the Bay of Biscay, underway to La Coruna, with some residual fog in the background. This picture was taken by our friends Bruno and Eva aboard Shangri La. 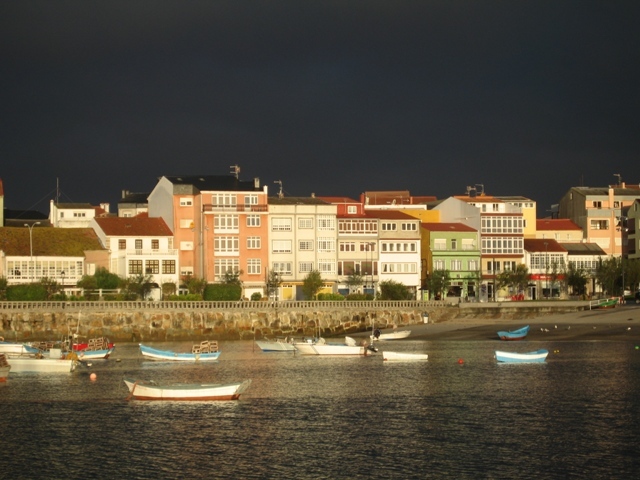 After crossing the Bay of Biscay, the beautiful town on La Coruña waited for us. 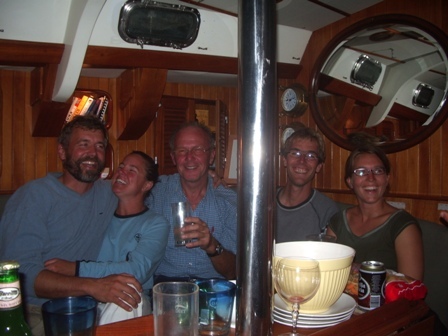 We sailed in at 4:00am under a beautiful starry night with a full moon and picked up a mooring in the outside harbor. 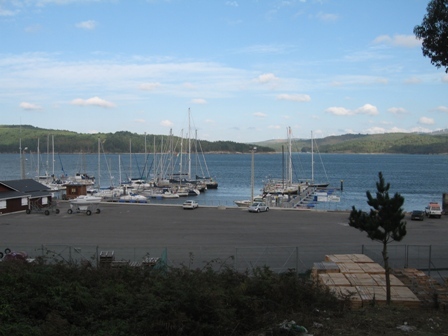 In the morning the harbor master came over to our boat and told us that Shangri La had reserved us a berth in the harbor at Dársena Deportiva. 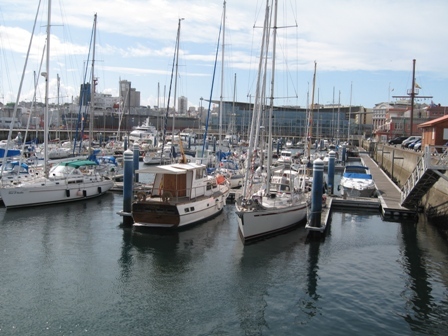 This picture is the view from the marina looking towards the city of La Coruña. It was such a fantastic feeling being here. There was such excitement in the air about successfully crossing the bay, the weather was warm, the sun was out and we were in Spain. It felt a little like arriving in the Azores. Another milestone was accomplished. 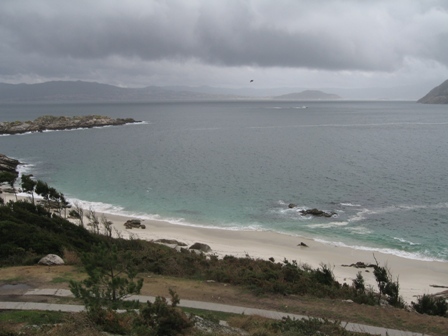 La Coruña is located in the region called Galicia, in fact the entire region of Spain that we will be cruising is all included in Galicia. 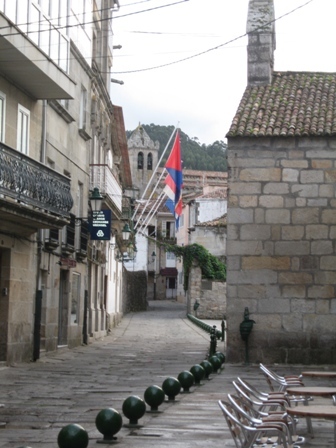 The outskirts of the city are quite modern and the center is where the old section is located, where there are narrow streets, balconies, parks and many small cafes. 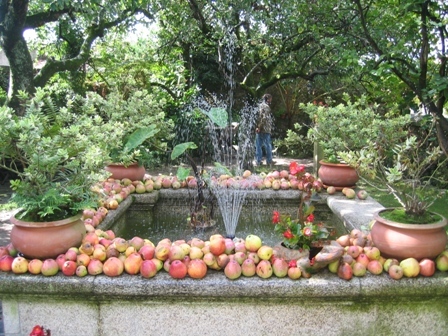 A square in the old section of La Coruña. 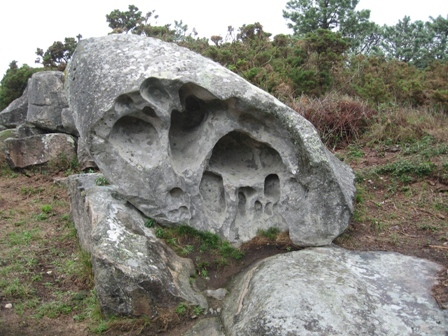 This is one of the places the locals meet and children play. One of the many little restaurants that was located in the old section of the city. 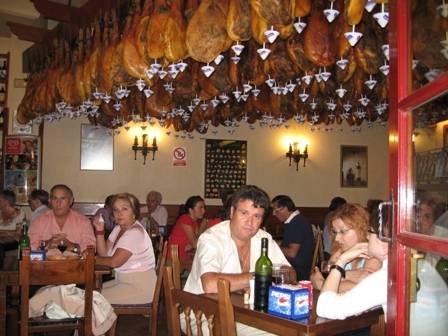 Here, jamón (ham) legs that have been smoked are hanging from the ceiling. The meat jamón is then sliced very thin and served with cheese, melon or cooked in different foods. Notice the drip catchers. The history of the city goes back to at least Phoenician times, who mined tin. The Romans were the first to actually charter the city. 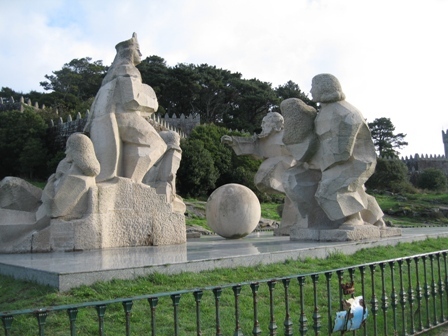 In 1588 the Armada departed from La Coruña and a year later Sir Francis Drake attempted to take the city, but failed. 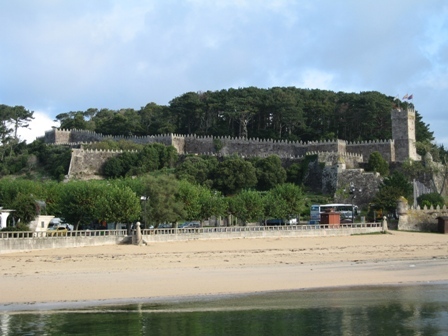 La Coruña also played a part in the Peninsula Wars. 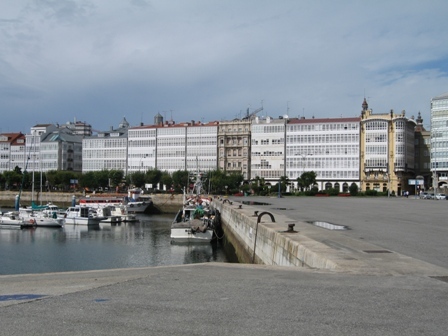 Today La Coruña is a busy fishing and commercial port. 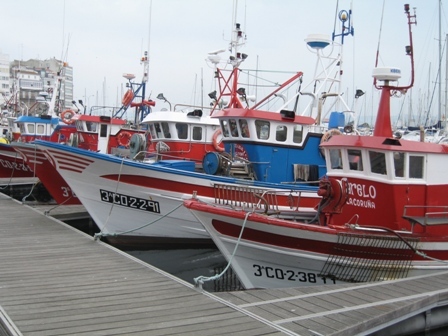 A picture of some of the fishing vessels. Each region in Spain paints their ships in specific colors to identify where their hailing port is. 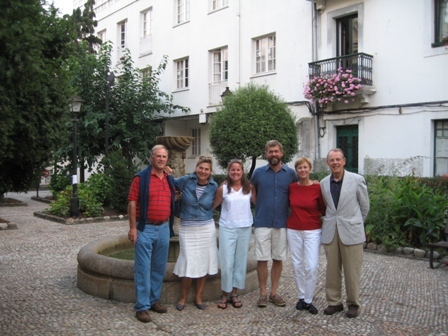 When we arrived in La Coruña, we called Henry and Judy Paap, friends of ours that happened to be in La Coruña at the same time visiting friends of theirs. They met Marco and I in La Coruña that same evening and with their friends, Frank and Isabel Despomare. 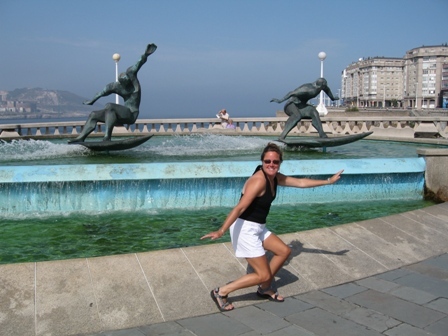 Isabel was born and raised in La Coruña and gave us an incredible tour of the city. They also took us out to a wonderful restaurant and introduced us some of the local cuisine. We had barnacles, shrimp, potatoes with octopus, pimientos and almond cake for dessert. What a great introduction to the amazing country of Spain. Thank you Henry, Judy, Frank and Isabel !!!!! 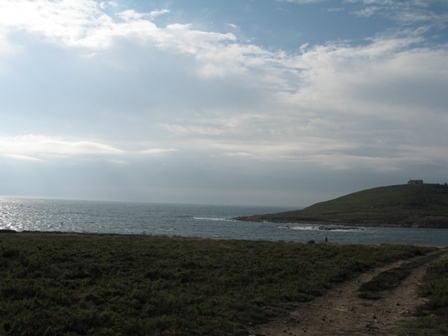 La Coruña also has the world's oldest working lighthouse, Torre de Hércules. 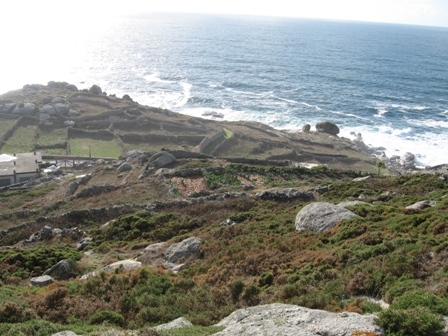 During the reign of the Roman Emperor, Trajan, during the second century AD, this site was chosen for the construction of the Torre de Hércules, so ships headed for the British Isles in search of tin, copper and iron could be guided. 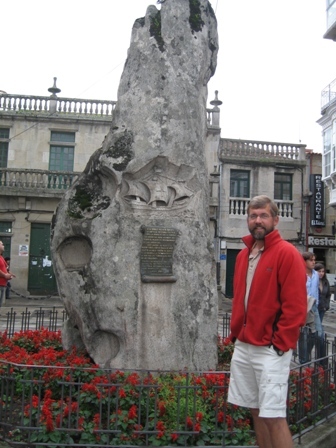 The tower was designed by the Coimbra architect, Cayo Servio Lupo, who dedicated the building the Mars, the god of war. Torre de Hércules was used as a lighthouse throughout the Roman Empire up until the 5th century, when the Normans raided the area and the citizens fled. 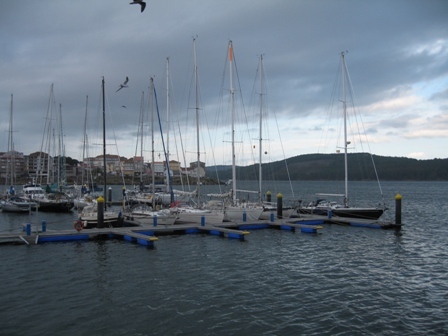 It was not until the 13th century when the ancient port was rebuilt and given the name "Crunia" by King Alfonso IX. This is the time that "Crunia" began to grow and prosper due to the sea trade. During this time however, the Torre de Hércules remained in a state of disuse and neglect. Many of the stones that the Romans placed were used to construct the Castle of San Anton and the city walls that were built during the 16th century to defend against the British. It wasn't until the 18th century that the Torre de Hércules was to regain it's importance and function of a lighthouse. This was a period in time that there was intense commercial activity and trade with the Indies. 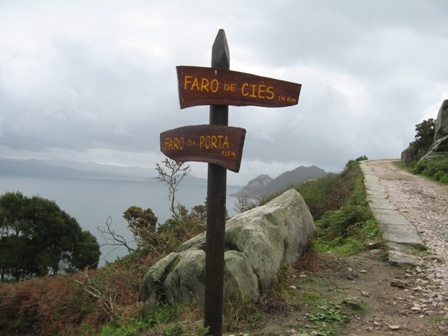 Ships from America and other Spanish and European ports would arrive carrying their precious cargos, which created the need again for a lighthouse to guide them. With the approval of King Carlos III, the Torre de Hércules was restored by the architect from Extremadura named Eustaquio Giannini. Work to reform the tower began in July of 1788 and was completed in 1791. 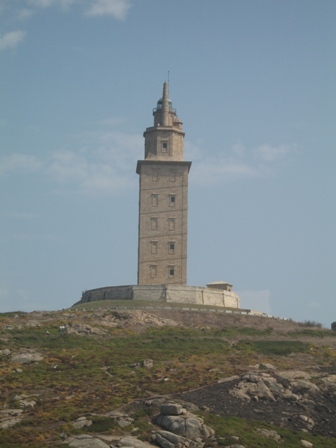 Torre de Hércules is now a landmark of the city of La Coruña. It stands on a hill that is approximately 60 meters (197 feet) above sea level and is 59 meters (194 feet) tall. From the outside of the tower you can not see any of the Roman origins but under the tower they are excavating and you are able to view what has been found so far. Marco and I climbed the 234 steps to reach the top of the tower where we were able to get incredible views of the city and the coastline. This same lighthouse was one of the guides that Marco and I used to enter the harbor at night. 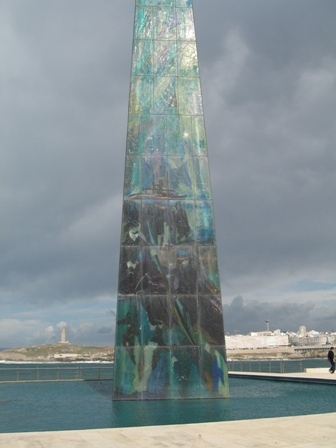 Isabel's father (Gerardo Porto Montoto) was the artist responsible for this beautiful monument that was erected to recognize the Millennium. 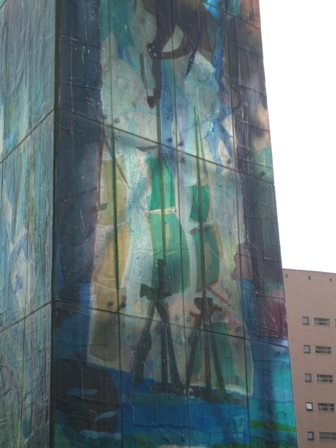 It was made of individual panes of glass that he painted separately. At night, lights illuminated the monument and it was truly a spectacular site to see. 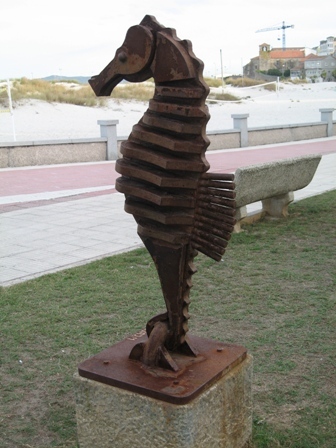 There was art all over La Coruña. This is just one of many beautiful fountains. The culture in Spain is completely different from any other country we have been to so far. The stores open around 9:00 am and then close at 12:30 for siesta until around 5:00pm and stay open until 9:00pm. The locals do not even think about going out to dinner before 9:30 or 10:00pm. 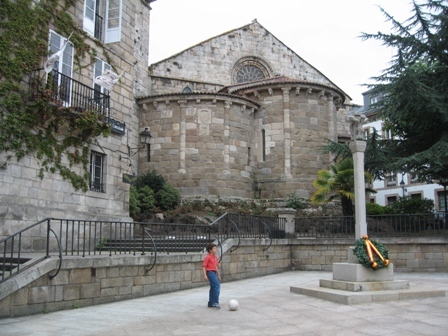 It is also not uncommon at all to see children playing in the main square in La Coruña way past midnight and their parents are dining in one of the many cafés surrounding the square. The bars don't really open until 11:00pm and then stay open until early hours of the morning. One night we went out for tapas with Jonas and Ylva, from Sweden. At 1:00am, Ylva and I decided to head back to our boats and the boys stayed out. They came home at 5:00am and they said they left the bars early, everything was just getting going. If didn't take long for Marco and I to get into the Spanish way. In La Coruña , on Saturday nights, all the young people start gathering around different squares where they bring drinks and socialize. We were amazed at how many people this included. Everyone looked like they were having a great time and not once did we see an altercation . Everyone was just there to have fun. Then, they all go to the bars where they eat tapas, dance and mingle. 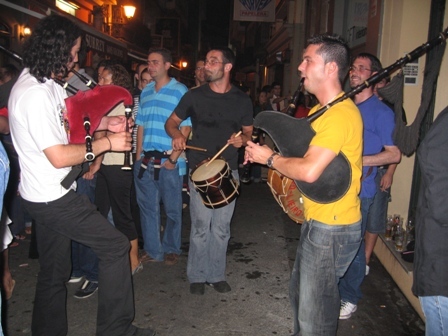 The above picture is of some guys having a battle of the bagpipes in one of the packed streets. The energy was really high and very fun to be around. 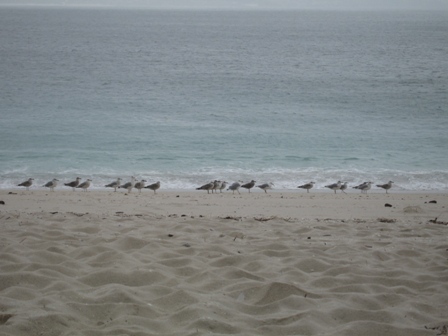 It wasn't all party time in La Coruña. Our Perkins 4.108 engine needed the exhaust elbow welded where some corrosion had occurred. Marco found a great man to do the job and it looked like new when it was done. It also was a bargain, only costing us 30 Euros, where a new one was $1,000.00. We also spent the week getting to meet others that are doing an Atlantic loop or sailing around the world for a couple of years. 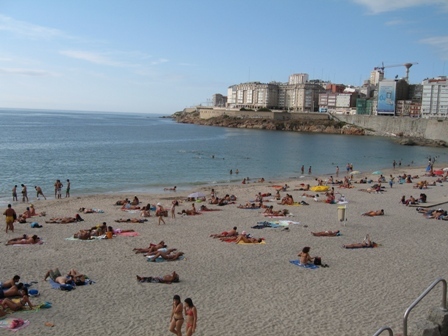 La Coruña is a popular stop off point for sailors. 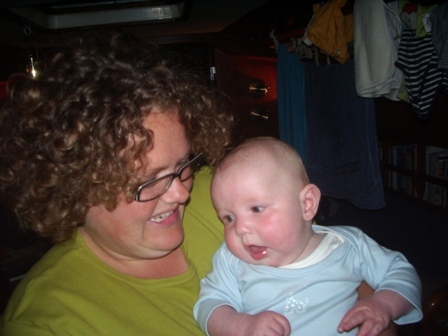 We have met many boats from Holland (Klef - Edo and Marieke, Dingo - Martin, Dirma and Boaz (4 months old), Lahaina - Eric, Marieke, Mirre (about 18 months) and her sister, Sannah (4 months old) and we also ran into Double Waters - Graham, Bridget, George, Jack and Jed from England. They actually caught our lines in Plymouth as they were preparing for their voyage. We also met Jonas and Ylva, from Sweden. 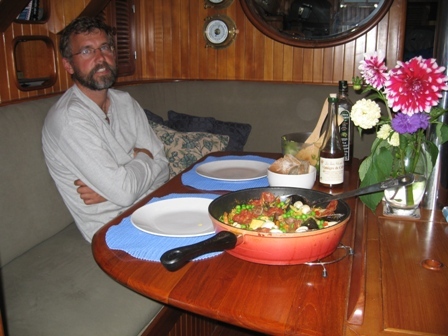 We went out for tapas, had movie night on board Dalliance and went over to their boat one evening. It has been really fun getting to finally meet people that are doing what we are doing. 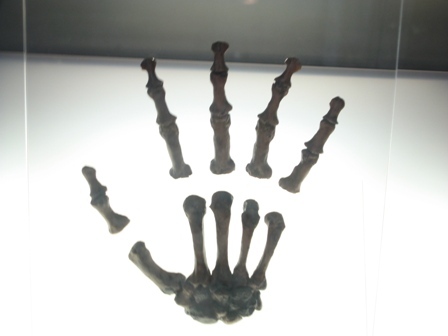 Neanderthal hand. Don't worry Suzanne, I haven't forgotten about biology. While in La Coruña, Marco and I visited the aquarium, Museum of Man and the planetarium. We are keeping our minds active in our professions also. 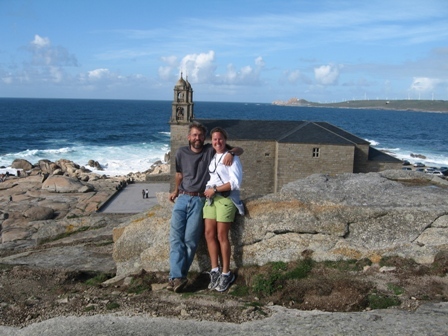 After spending 10 wonderful days in La Coruña, we set sail for Lage, where we were hoping to hook up again with Frank and Isabel. When we arrived in port we anchored. This was the first time that we were able to anchor since Dover. In the harbor were 2 other Dutch sailboats, one of them being Klef. We figured that this is were we would start running into other boats that we have seen before. 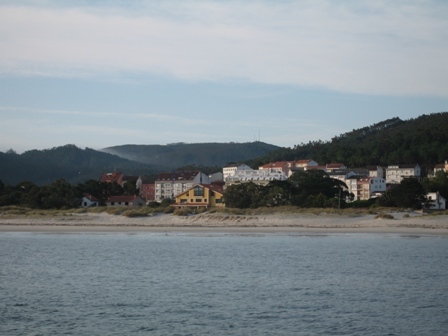 Lage is a typical Galician fishing village. 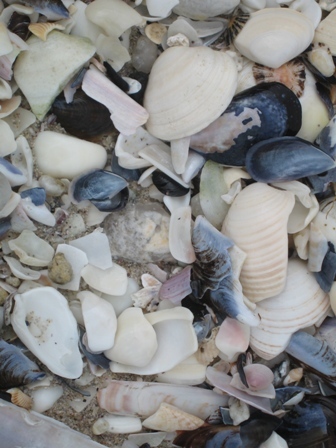 It has beautiful white sandy beaches with a wonderful path along the sand dunes. Along the pathway were iron sculptures. I really like seahorses so this one caught my fancy. They say when you scuba dive in the Canary's we will see them, I can't wait. 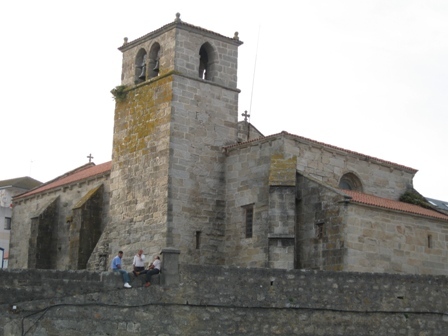 Lage also had a beautiful 14th century church, Santiago de Lage that overlooked the harbor. Once we pumped up the dingy and got into town we called Frank and Isabel. They came and picked us up and took us to their wonderful home that overlooked the harbor. After drinks they brought us to this little restaurant and we proceeded to have the best meal we have had so far. We had gambas con ajillo (shrimp with olive oil and garlic), bacalao (cod), salad and batata frita's (french fries). It was truly an amazing meal. We have noticed that in Spain the food is very fresh and prepared simply so that the true flavor comes out. The batata's are also cooked in olive oil and are absolutely delicious. They spoiled us and we are very grateful for everything. They also provided us with books (books in Dutch for Marco) and picked their last lemon from their own tree for me. We look forward to spending more time with them when we get home. Thank you again, we can't thank you enough. 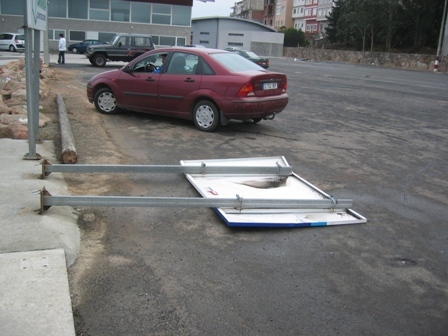 We were only able to spend one night in Lage because we had been tracking Hurricane Gordon and in 2 days time it was forecasted to hit northern Spain, so we wanted to get to a well protected harbor from Southerly winds. 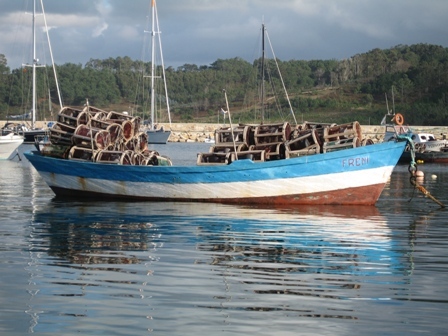 We decided that Camariñas was a good place and picked up anchor early in the morning. As we were leaving, Klef with Edo and Marieke were also leaving. Little did we know that we would form a unique bond with them and a few other boats, we would be Hurricane Gordon survivors!!!! Marieke and Edo on Klef, leaving Lage for Camariñas. Here is the picture of Club Náutico in Camariñas where we decided to ride out Hurricane Gordon. We chose this area because Ria Camariñas is known to be an excellent shelter from winds in all directions, especially from the south and west, the projected direction of wind from Gordon. When we pulled into the marina we were excited to be next to Klef. 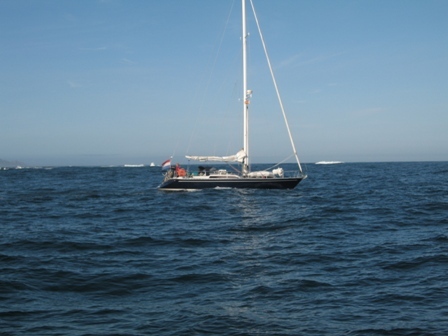 We also noticed Dingo and another Dutch boat, Hafskip with Joost and Ilse, out in the anchor field. It wasn't long before Dingo and Hafskip also became our neighbors. The projected path and wind speeds with the probability of where Hurricane Gordon may hit. We are located right in its path, according to this forecast on September 20th. We knew that we had about 36 hours to prepare Dalliance before Hurricane Gordon hit so first thing the next morning we started. 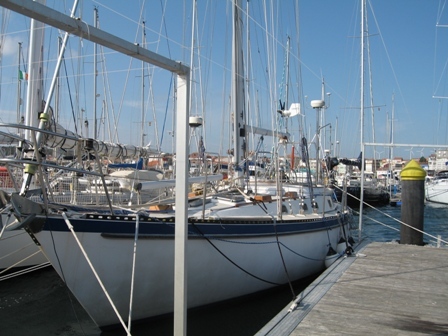 To prepare Dalliance we first removed all the sails, (main, yankee and staysail), the dodger and all the life rings. Basically we wanted to remove anything that could catch air. While we were doing this we had quite a few other boats come up to us and enquire about what we were doing. We are sure that many of the other boats thought we were going a little overboard, but in little while we noticed almost all the other boats doing the same thing. We later heard that they said, "Well, the Americans do get hurricanes so maybe it's not a bad idea, lets do what they do just in case". After removing the sails Marco began to add lines. Our bow is facing south into the wind, so Marco placed four lines on the port bow and four lines on the starboard bow. Two of the bow lines are the anchor lines with a chain lead which he secured to the dock itself and to the mast in case of cleat failure. Additional spring lines and stern lines are also placed. All the fenders were also secured to protect the hull from the pontoon fingers, and cleats. When he finished, the boat looked like it was encased in a spider web. After getting all the lines in place, Marco and I headed to the hardware store to buy tubing to cover the lines to prevent chafing. We ended up buying quite a bit and passed it around the dock. Along the dock the atmosphere was supportive with a palpable feeling of anxiety in the air It almost seem surreal that a hurricane was going to hit within 24 hours, as we prepared the boats the weather was beautiful. Dalliance in her spider web. After we felt that we had done everything we possible do to limit any damage to Dalliance, Marco and I went for a walk to the point and watched Hurricane Gordon begin to appear. When we returned from out walk we were very excited and surprised to see Sepia with Frank and Marijke. 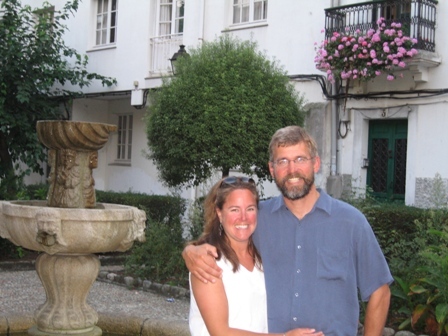 They had left from Falmouth, England and were headed to La Coruña until they got our email that we were riding out the storm in Camariñas, so they decided to try to make it here before the storm. They actually arrived about 6 hours before we started to feel the first winds. 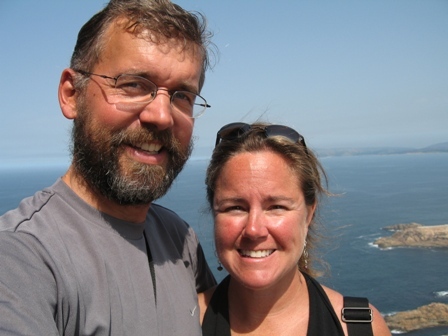 Frank and Marijke were one of the 2 couples that we rode out the gale outside of Falmouth with during our first crossing. Now we would be together once again as Gordon passed. 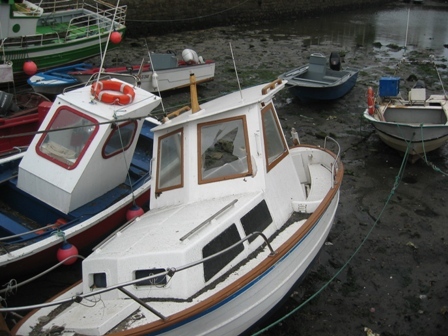 How the boats looked after preparing for Hurricane Gordon. Marco and I went to bed early this evening because the winds were supposed to reach their peak early the next morning. Throughout the night we both got up frequently to check the Navtek for additional updates on where Gordon was. From about midnight on, the winds progressively began to get stronger and the harbor quite a bit rougher. Throughout the night everyone was checking their lines and making sure that the lines were holding and the boats still were O.K. Everyone was also constantly making sure that everyone else was doing alright and helping one another with fenders, etc... It really helped knowing that we had friends right there looking out for us. At 0715 LT the barometer dropped even more (it was 1017mb at 8:30 the night before) and was reading 990 mb and the wind was blowing 20-30 knots. By 0815 the barometer now only read 987mb and we were experiencing winds of 74 knots (85mph) that we recorded on the anemometer while two other boats were registering winds as high as 85 knots (98 mph). Up until this point we were feeling pretty secure in Dalliance. 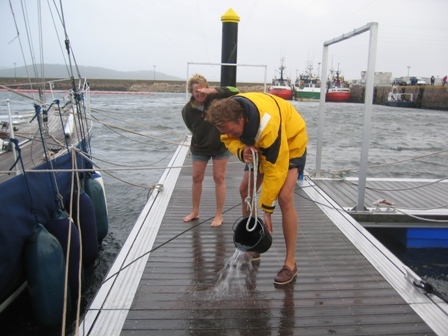 However, when the wind reached the 74 knots Dalliance's bow started to raise and the rigging started to really shake. All of this was quite a feat considering that Dalliance weighs 30,000 lbs! I had packed a ditch bag that contained the satellite phone, credit cards, first aid kit, water, some food, basically anything that may be needed if we were to abandon Dalliance, which at this time we were strongly considering. Marco was able to receive a weather fax however, and it showed that the eye of the storm was passing just north of us and the barometer was beginning to rise. This all meant that the worst was over. Sure enough, by 1030 am the barometer had risen to 998 and the wind decreased to 20 knots in the marina. Everyone was now out of their boats, very excited to be SURVIVORS OF HURRICANE GORDON. We all assessed for damage and luckily none of our boats sustained any. Martin and Dirma aboard Dingo as the sun rose and the winds became stronger. 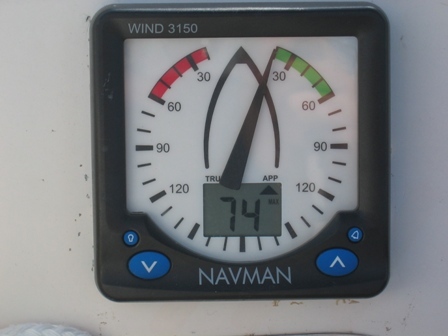 The anemometer reading 74 knots of wind!!! After the storm, everyone checking to make sure no damage was sustained to comparing stories!! During the storm we were really concerned about projectiles but we never imagined we would have to worry about this!! Edo cleaning off dog poop from the dock that was carried from the shore during the storm. I guess this may be where the saying came from, "When sh** hits the fan." Top left: Marco, Me, Frank, Joost and Ilse. 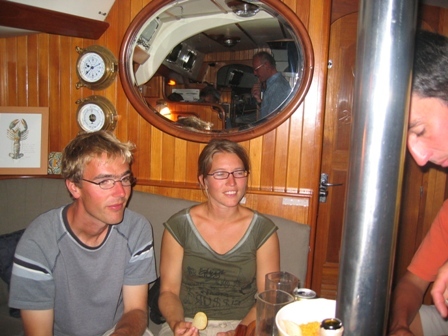 Top right: Edo, Martin and Marieke. Bottom left: Dirma and Boez. Bottom right: Joost and Ilsa. Bottom center: Marieke and Marijke. 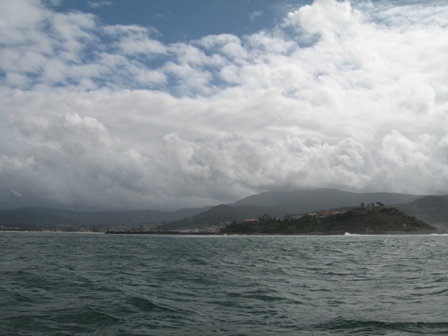 We ended up spending 5 days in Camariñas due to strong southwesterly head winds. 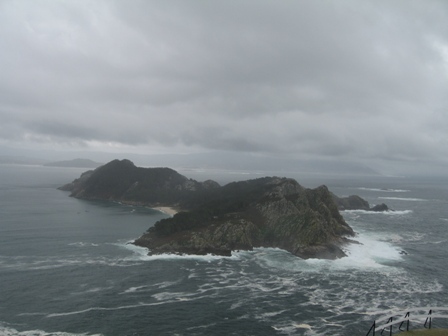 We did not want to sail by Cape Finisterre with those conditions, even though we were going a little stir crazy in Camariñas. 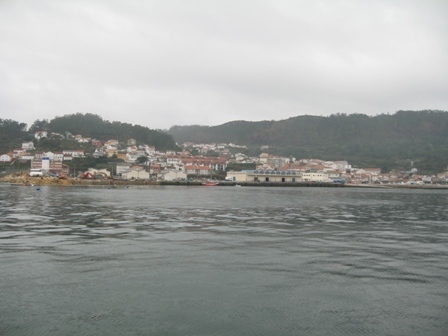 So, the gang decided to sail across the Riá to the small town of Mugia. Ten minutes motoring we found ourselves in this beautiful harbor. 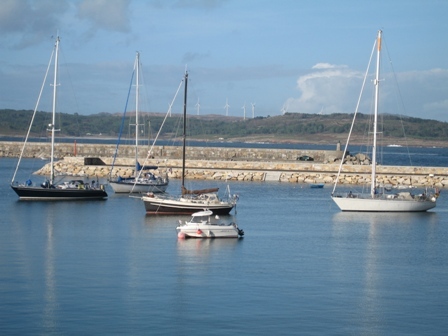 The "Dutch Flotilla" at anchor in Mugia Harbor. Left to right: Klef, Dalliance, Hafskip, Dingo. This was the second time since Dover, UK that Marco and I had anchored. We expected to be anchoring much more, but either there were no anchorages, or the wind conditions were not favorable, leaving the anchorage unprotected. Once we made sure our anchor was set, Marco and I pumped up the dingy and headed for shore. 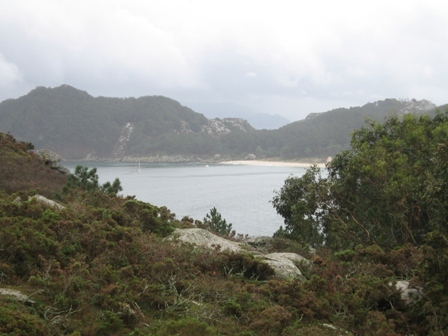 Mugia is a very small fishing village with nice walks, hills and dramatic seashore. Along our walk we stopped at a cemetery and started up a conversations with an elderly Spanish gentleman. Not speaking much of each other language, it was amazing how much we were able to communicate to one another. His wife even showed us her knees where she had just had bilateral knee replacements. 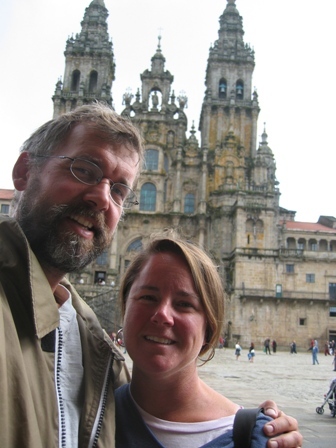 They told us about the 17th century church, La Virgen de la Barca, that was a must see so after saying our goodbyes, Marco and I headed in that direction. This is a church that is dedicated to the fishermen and is often closed. However, we were in luck and a service was happening so we got to have a peak inside. Hanging from the ceilings and along the walls were models of ships that had gone down at sea. It was quite a moving experience to be able to see something like this. 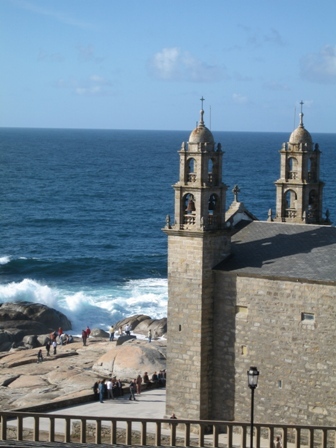 Outside the church was a dramatic sea shore with waves crashing and there were even a few women that were crawling on their knees over a cobblestone walk way to a statue that they would kiss once they reached it then walk into the church. One of the many fishing boats moored in the harbor. 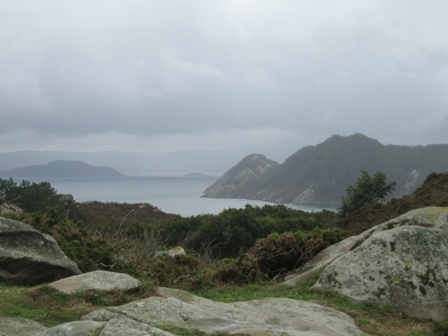 After taking in the church, Marco and I hiked to the top of Punta de la Barca. 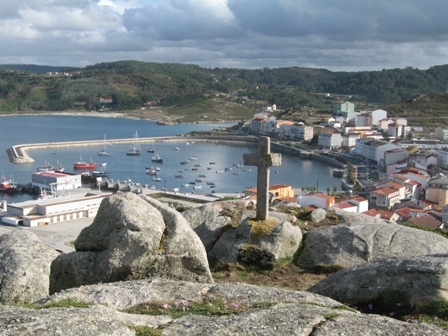 The views were amazing overlooking the riá, the town of Mugia. At night there were lights that also illuminated the hill and the cross at the top of the hill. It was quite beautiful. Mugia the next morning as the sun was just beginning to rise. 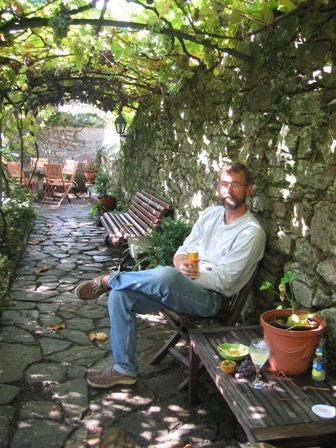 When Marco and I had planned this trip we envisioned ourselves spending less time in Spain and more in Portugal. When we arrived in Spain however, we found the riá's (estuaries) to be so beautiful and each one unique, that we changed our plan and decided to spend more time here. 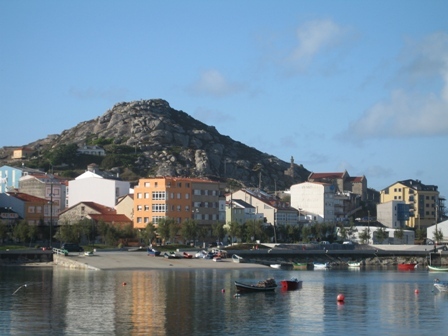 Muros is a beautiful old fishing village with narrow streets, open air markets and a good anchorage. The village itself is nestled among rolling green hills and has a nice walk along the shore. Once again the "Dutch Flotilla" anchored together and we had a nice time together. Martin (Dingo) and Joost (Hafskip) are both IT guys and they taught Marco how to use a Pringles can and a colander to receive wireless internet better. The six of us also met in town for drinks and relaxed. That might sound funny, taking a year off from work and needing to relax, but it really is needed. 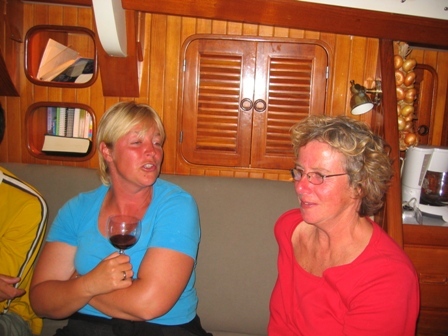 Since every place we go to is new to us there is always a level of anxiety associated to pulling into a new harbor, also planning the sail, checking the weather, etc... It also takes so much longer to get things done on the boat, that just running to get something at a hardware store could take all day. All of us cruisers call this "boat time" and can not believe how busy we are during the days. We also appreciate how funny it sounds to our friends and families back home. 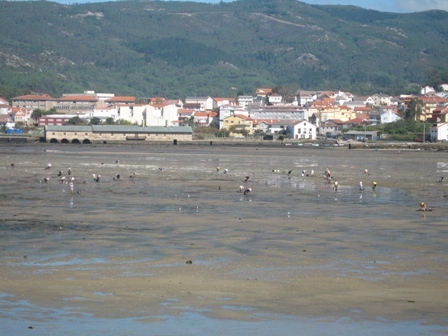 During low tide the locals could be seen digging for clams and oysters. Also early in the mornings you would see small row boats and the men trailing just fishing lines while jerking them now and then, fishing for squid. Marieke and Marco decided to give it a try from our boat. I even bought cornstarch to sauté them in and found out how to clean them in one of my cookbooks. Unfortunately neither the cornstarch or the cleaning was needed. We were skunked!! 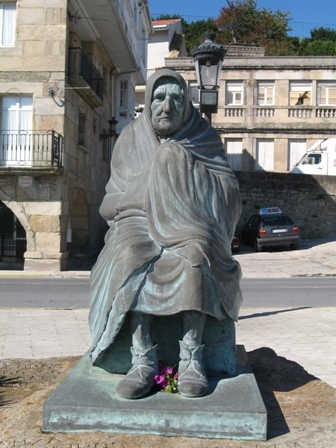 This was a statue at the end of the open air market. Another reminder of how important fishing is to the Spanish. Here a women is waiting for her husband to return from sea. In Villagarcia de Arosa we met back up with Frank and Marijke. 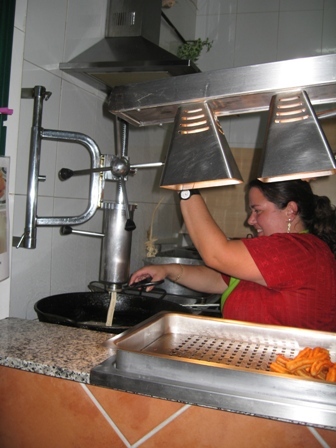 That evening we went out for tapas but before dinner Marijke introduced us to Churros. They are a deep fried dough that forms a tubular fritter that tastes like a doughnut but not as sweet. They also taste like the Dutch treat oliebollen. Marijke spoke Spanish with the woman who ran the little stand, who then treated us to fresh made Churros. She would not let us even pay for them. Fresh Churros being made for us. Marco, the Spanish baker, Marijke and I enjoying Churros. 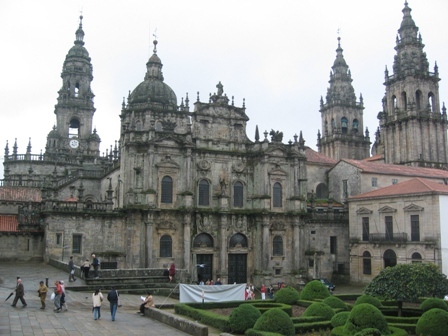 The next day Marco and I took the train into Santiago de Compostela where Saint James, one of the twelve Apostles, body lays. 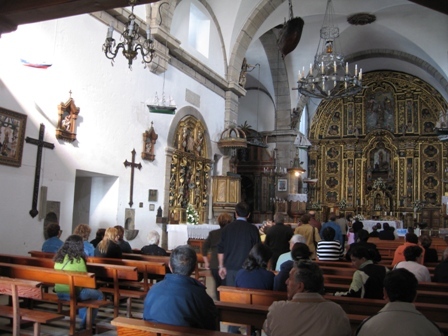 Santiago has been a pilgrimage site since the medieval times. 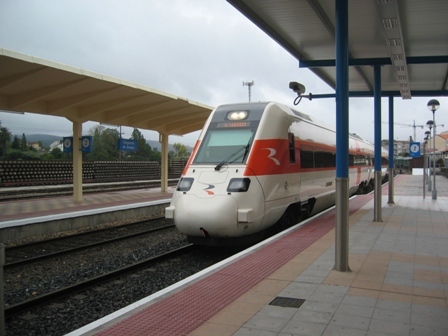 The train that we took into Santiago de Compostela. The Cathedral of Santiago from the Praza da Inmaculada. The Cathedral of Santiago was built over a necropolis of at least 182 Roman tombs. In the center of the cemetery was the tomb of the Apostle, Saint James. The tomb was housed in a mausoleum dating from the 1st or 2nd century. The present cathedral was started between 1075 and 1078, with additional structures being added later. 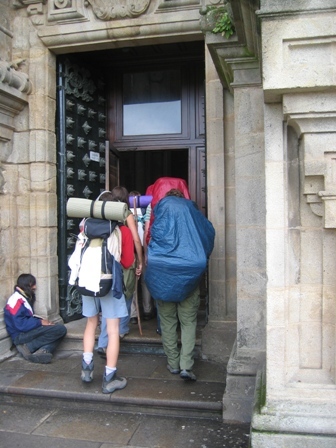 A few of the pilgrims that have walked for many miles/days to reach the Cathedral of Santiago. 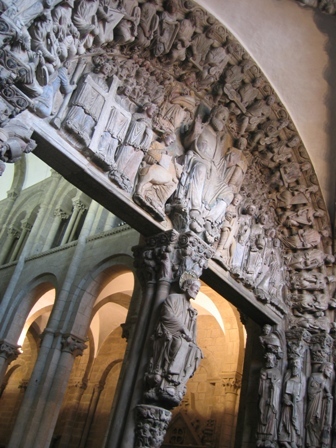 Here is a picture of the Portico of Glory where the traditional pilgrim first enters the Cathedral. 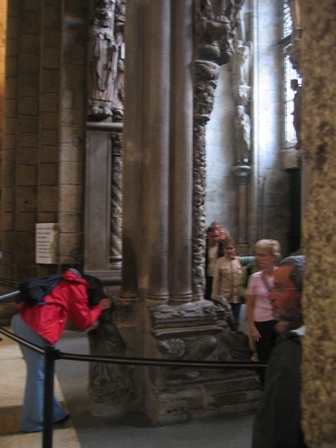 The custom is to place a hand on the central column then walk to the back side and touch their forehead against the Santo dos Croques (Saint of Bumps). In 1879 excavation began around the cemetery to find the remains of Saint James which had been hidden in the 16th century from Sir Francis Drake during his pillaging. 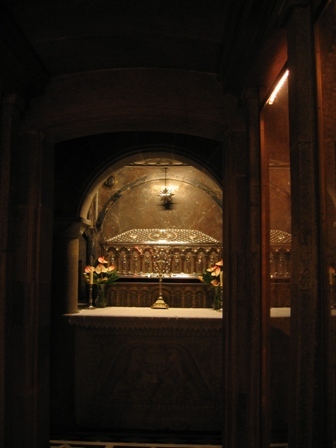 Here is a picture of the Crypt with the Marble Casket. The casket is actually made of silver, placed on a marble alter, and contains the remains of Saint James, one of Christ's chosen followers. It also contains the remains of two of Saint James's followers, Athanasius and Theodorus. 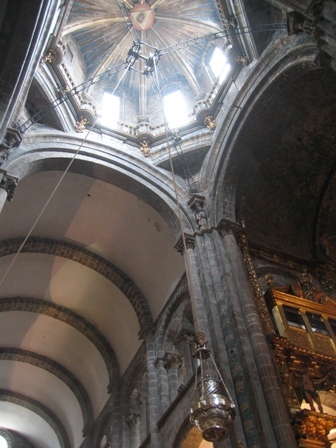 Inside the Cathedral in the central nave, is the great incense burner. When in use it is swung from side to side. The incense burner is silver-plated and has been in use since the 14th century. This actual incense burner is from 1851. 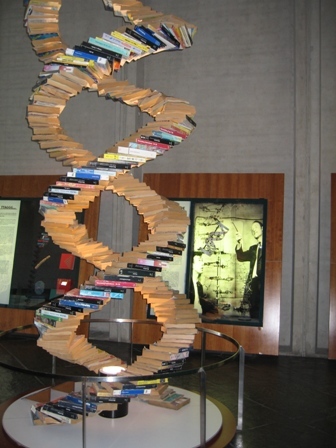 There are a couple explanations for its use. The first one that it has a ritual function. It is supposed to add solemnity and prestige to certain acts and important visits to the Cathedral. Secondly, it perfumes the air inside the Cathedral. 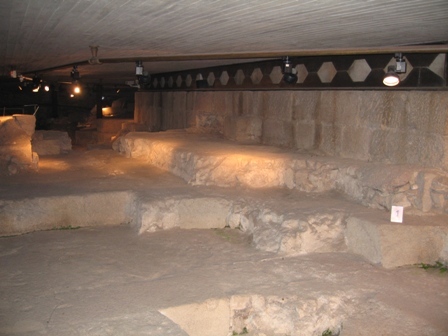 This space us always crowded with visitors and for centuries was actually used for a place that pilgrims could sleep, whose personal hygiene must have left much to be desired. 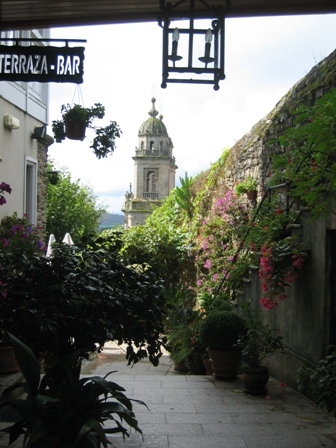 After touring the Cathedral, Marco and I stumbled on this wonderful terrace bar and quenched our thirst. When you get a drink in Spain it is common practice that you are also served a little something to nibble on, usually olives, cheese or potato chips that are fried in olive oil. That night I made seafood paella for dinner. I have been experimenting with regional foods along our trip. It is pretty ironic, for how much I like to cook, that the only thing that I forgot to pack for the trip would be my pots and pans. 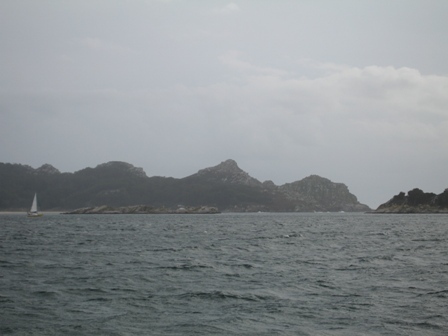 The Islas Cíes are made up of three islands, Isla del Norte, Isla del Faro and Isla de San Martin. 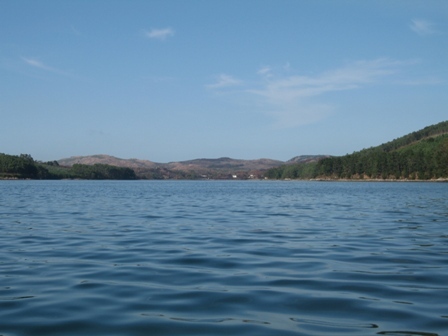 The whole area is a nature park and is mountainous and wooded. 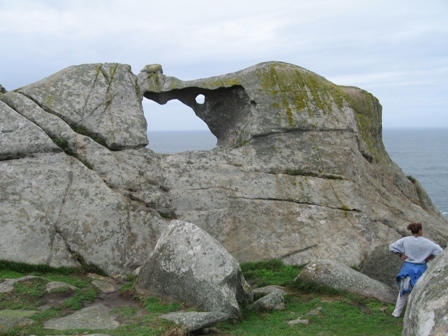 The islas are also bird sanctuaries with herring gulls, lesser black-backed gulls, shags and a few guillemots that live there. 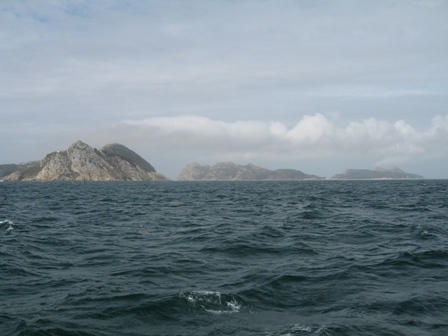 You are not allowed access Isla de San Martin but anchoring was allowed and it provided us with good protection from the strong southwesterly that were occurring. Some of you may be wondering where the northerly winds are, we are wondering the same thing. We have not experienced any of the Portuguese trade winds that are supposed to be here, which has made sailing difficult and progress slow. 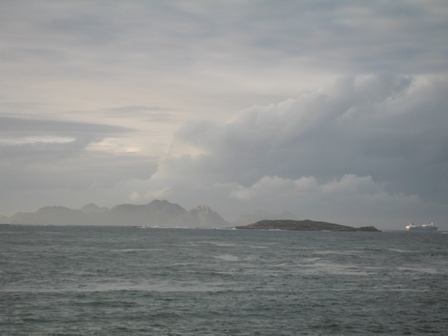 The Islas Cíes as we are approaching. Dalliance at anchor off Isla de San Martin. It was pretty rough the first night anchoring here so Marco and I took anchor watch during the night. Marco marked on the chart plotter where he dropped the anchor (210 feet of chain in 30 feet of water) and we would check during the night if we were dragging or not. Our faithful anchor held well during the night so the next day we decided to jump in the dingy and do some hiking up to the lighthouse on top of Isla de Faro. The beach and some of the "sand" that made up large areas of the beach. 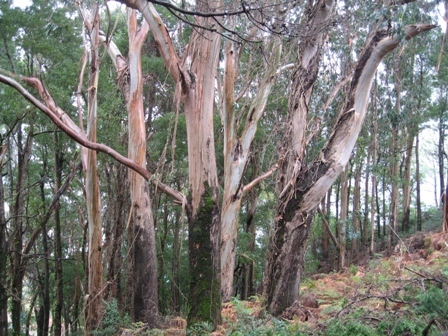 There were thick forests of Eucalyptus trees along the path along with unique rock formations. Dalliance at anchor as seen from Mte do Faro. The view from the top was spectacular. We were the only ones up there and it had seemed like such a long time that we were someplace that isolated. It was really a special place to be. After our hike we headed back to the dingy but as we did the wind (southwest) picked up again and it began to downpour. Unfortunately now the wind was against us getting back to the boat so we waited for a break in the weather to happen. After about 1/2 hour the wind seemed to let up a little so we decided to go for it. We jumped in the dingy, got the motor to start and started heading against the wind and the waves back to the boat. As we are slogging along, we looked behind us and the Spanish Coast Guard is following us to make sure we got aboard safely. We later heard from Hafskip that the Coast Guard did the same for them a day later. Thanks guys!!!! 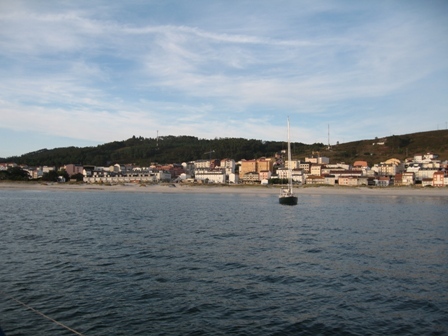 Approaching Bayona from the sea. A view of the marina from the Monterreal Fort. Bayona is a pretty tourist resort and also has the secure place in history as being the place where Columbus' first mainland landfall was in 1493 after returning from the New World. In fact there is a replica of the Pinta that is permanently berthed in the harbor and a rock very similar to our own Plymouth rock. Bayona would also be our last port in Spain. 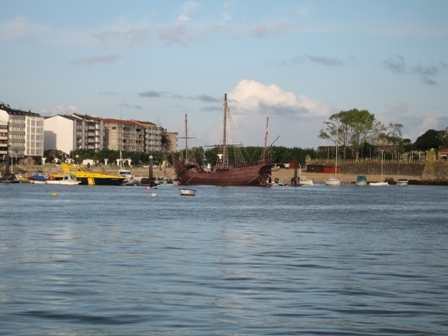 Replica of the Pinta moored in Bayona Harbor and Marco in from of the Monolith of Columbus' arrival in the Port of Bayona. 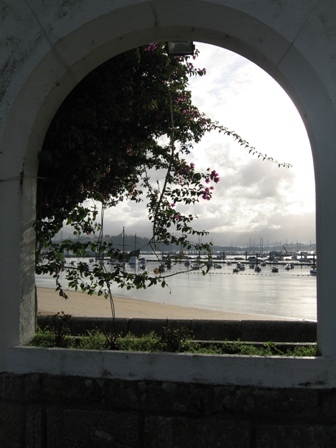 A view of Isla Cíes from the path along the waterfront in Bayona. 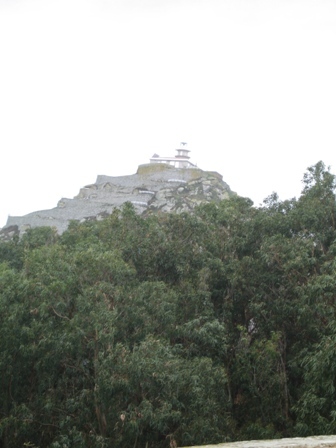 This is Monterreal Fort and is located on the Mount Boi peninsula. Over the past 2000 years this site has been known as the walled precinct. Pre-Christian civilizations such as the Celts, Phoenicians and the Romans once lived here. 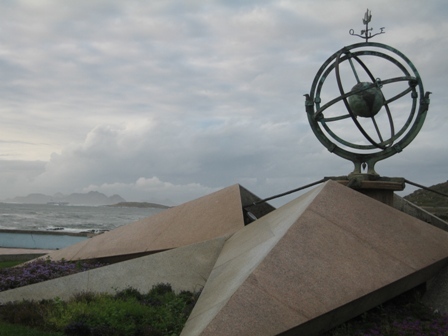 The Monument to the Meeting of the Two Worlds. This was constructed very near the place where the first native American who died on the old continent was buried. Here is a section of the old part of town. All along the narrow streets are quaint restaurants and cafes. 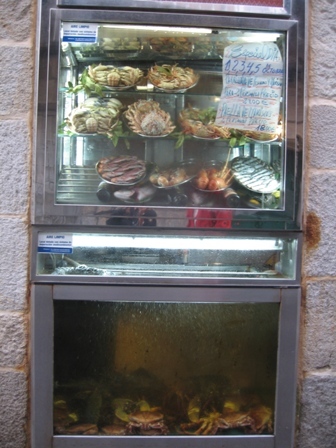 The cafes advertise what type of fresh seafood is available that day with these displays outside of the cafe. We saw these everywhere in Spain. At the marina docked close by was our British friends from the boat Double Waters. We had actually met them for the first time when they helped us dock in Plymouth, UK, where they were just preparing their boat for their trip. 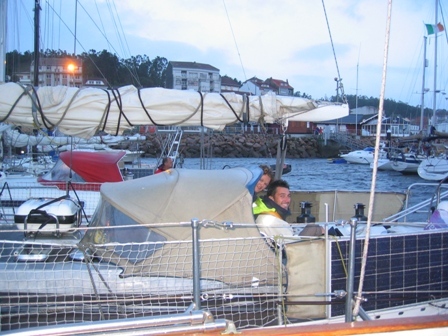 We met back up with them again when we returned the favor and assisted them in docking at La Coruña. Aboard are Bridget, Graham, and their 3 boys, George, Jack and Jed. 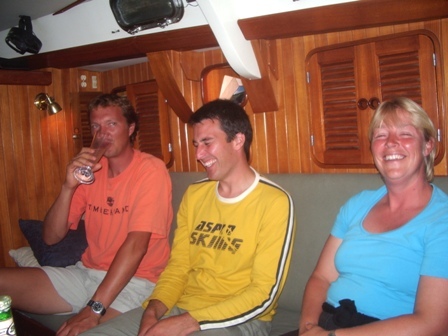 We invited them over one night for snacks and drinks along with Joost and Ilse from Hafskip. George and Jack brought along their guitars and played a few songs for us. It was a really nice evening.